Uinta Brewing today announced expanded distribution throughout Kansas, signing an agreement with the Kansas Craft Alliance, a statewide network of 13 Anheuser-Busch wholesalers. The brewery, headquartered in Salt Lake City, will begin shipping core Uinta offerings like Hop Nosh IPA and Cutthroat Pale Ale to Kansas this week. Founded in 2009, the Kansas Craft Alliance consists of Western Beverage, City Beverage, Flint Hills Beverage, House of Schwan Inc., Pestinger Distributing Co., Mussatto Bros., Strathman Sales, Eagle Beverage Corp., O’Malley Beverage of Kansas, Crawford Sales Co., Schatz Dist., Seneca Dist., and Vidricksen Distributing. The collective sells a variety of craft brands — including major players like Sierra Nevada and New Belgium — across multiple territories and offers one-stop distribution and marketing solutions for brewers seeking statewide exposure. “Representing a great partner like Uinta is an honor and we look forward to having such a prized brewery in Kansas,” added Jerrod Nelsen, brand development manager for the Kansas Craft Alliance. 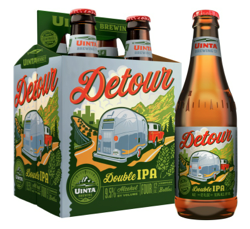 With the addition of Kansas, Uinta beers are now sold in 29 states and Washington D.C. In 2014, the brewery, which sold a partial stake to a private equity firm in 2014, sold 77,168 barrels.